Sinquefield Cup Recap: All Eyes On London! The final round of the Sinquefield Cup saw just one decisive game, and no big surprises. Aronian easily held a draw to clinch his victory. 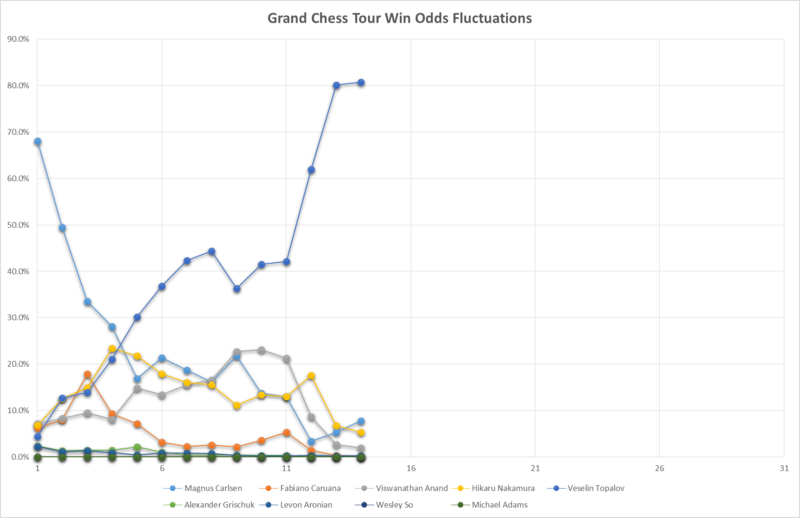 In that sense the game results had relatively little impact on player’s long term chances to win the Grand Chess Tour (although Nakamura of course gained a fair amount of ground with his win over Grischuk). 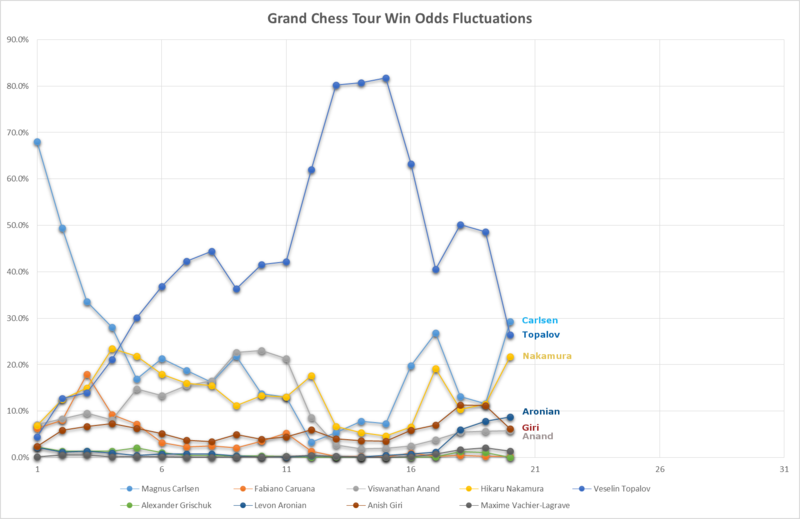 After the games were completed, though, something did happen that had significant impact on the Grand Chess Tour odds: tie breaks were calculated. As I lamented during Norway Chess, I have not yet found a good way to build proper tie breaks into my simulation model. I’m still using a version of the model I originally designed for the Grand Prix, where in the case of a tie for a given spot, points were distributed evenly among all tied players. However the Grand Chess Tour uses tie breaks and assigns whole point values to each individual instead. In the case of a four way tie for second place, as we had in this event, that makes a big difference! A four way tie was relatively likely as we entered the last round. Any time it happened in a given simulation, the model assigned 7.75 GCT points to each player in the group. However in reality those four players were going to get 10, 8, 7, and 6 points, based on their tie breaks. As it turned out this scenario did come to pass, and the 10 points for second place went to Magnus Carlsen! The 6 points for fifth place went to Anish Giri. This means that our model now shows Carlsen as having much improved odds of winning the tour as compared to our round 8 predictions – not because he gained ground in the standings but because his tie breaks were strong. Giri, similarly, suffers a drop in his odds. Meanwhile Topalov, who after round 8 we still had as a strong favorite to win the tour, came out on the short end of his own tie break. He tied with Grischuk for sixth place, but earned seventh place points (4), where the model would have given him 4.5 points towards the standings any time it simulated this actual scenario. Carlsen gaining ground from tie breaks, while Topalov lost ground, meant a big shift. The model now views Carlsen as the favorite to win the Grand Chess Tour! The most important takeaway here is that the final leg of the tour, which will be played in London in December, will decide everything! We enter that last stretch with three players very close at the top, as Carlsen, Topalov, and Nakamura all have between a 20 and 30 percent chance of victory, while several others among the “field” are not at all eliminated either. Aronian, Giri, and Anand each have better than a five percent chance. For those geeky readers out there who may have rolled a few 20 sided dice in their time, that’s better than the odds of rolling a natural 20! We all know it can happen! Certainly London will be a show worth watching. Halfway through the Sinquefield Cup it appeared that Topalov might be completely running away with the Grand Chess Tour, making London just a battle for second place, but conveniently for those of us who, as fans, might prefer some drama he fell off the pace in the second half and now the field is wide open again! 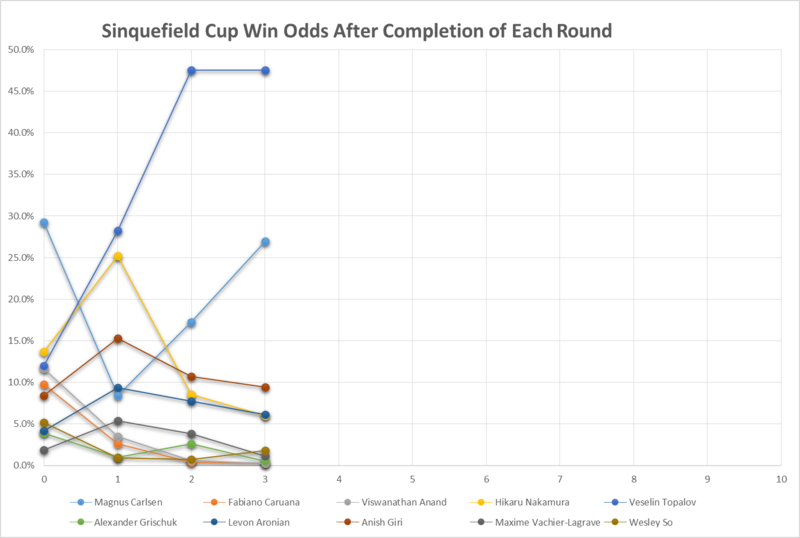 The penultimate round failed to produce a decisive game, but five draws actually had a somewhat substantial impact on the odds. Namely, Aronian is now a much greater favorite to win the event than before. This should be intuitively odd, he held serve and noone gained ground on him, which is basically a win. Clearly a full point lead with just one round left to play is a lot safer than the same full point lead with two rounds left, and at least a share of first place has been clinched. Now he needs only to win or draw in the final round to guarantee sole victory and 13 points in the Grand Chess Tour standings. Of course he does have the black pieces against Topalov, so that’s not entirely sewn up yet. Our model gives Topalov roughly a one in three chance of winning the game, which would allow any of four players (Carlsen, Grischuk, Giri, or Vachier-Lagrave) opportunities to tie Aronian for the lead with a win. Since five draws is a relatively boring result, in terms of how it impacts the standings, let’s find something other than odds of victory to discuss. How likely are five draws? Much fuss was made in the first round of the fact that five decisive games were played. Is it similarly surprising that all five games were drawn? Not entirely. More than half of all games between elite players are drawn, so of course it’s more likely to get five draws than five decisive results, but it’s actually not as huge of a difference as you might suspect. We can see that having NO decisive games in a round should be pretty rare too! Somewhere in the range of a 1/18 chance. As it works out, this should mean that in any given tournament with this format (a 10 player round robin, where nine rounds are played with five games per round), we should have about a 60% chance of making it the whole tournament without ever seeing five draws in a round. Norway Chess saw five draws in round 7, so that’s two tournaments in a row where we’ve seen it happen. It’s not the most common format, but five draws in a single round did NOT occur at Shamkir Chess 2015 (the Gashimov Memorial), and there was also at least one decisive game in every round of Norway 2014. This is a very small sample, but at a glance it seems to support the table above. Maybe treating every game as an independent event (as our model does) isn’t so bad! I do have plans to examine this idea in more detail at some point in the future though. Intuitively and anecdotally, without analyzing data, it “feels” like it’s more common for every game in a round to be drawn in later rounds. There is the logical explanation for this idea that in later rounds you’re more likely to find players who “want” a draw, based on their tournament position, and perhaps draw rates might increase. I feel this concept is worth studying closer in the future, to see if the data support or disprove the concept, but if it’s a real effect it’s probably not too strong, so for the meantime I will continue simulating tournaments on the assumption that all games are independent of each other. We didn’t manage to post an update of the odds after round 6, but not much changed. Carlsen remained around 53% to win the Sinquefield Cup, Aronian remained around 17% to win. Nakamura’s win and Topalov’s loss caused them to swap places, with Nakamura improving to 15% from 4%, and taking over as the third most likely victor, and Topalov dropping to just 3% from almost 17% before the round. It was just minor shuffling though, for the most part little changed in round 6. Not so in round 7, where there was a drastic shakeup at the top! Carlsen and Aronian entered the round tied, and the odds heavily favored Carlsen going forward by virtue of his much higher rating, but instead round 7 shocked the standings when Carlsen lost to Grischuk and Aronian defeated Nakamura in the same day. Suddenly Aronian emerged with a full point lead and just two rounds left to play, making him now a huge favorite to win the event! As for the Grand Chess Tour, things were actually the other way around. 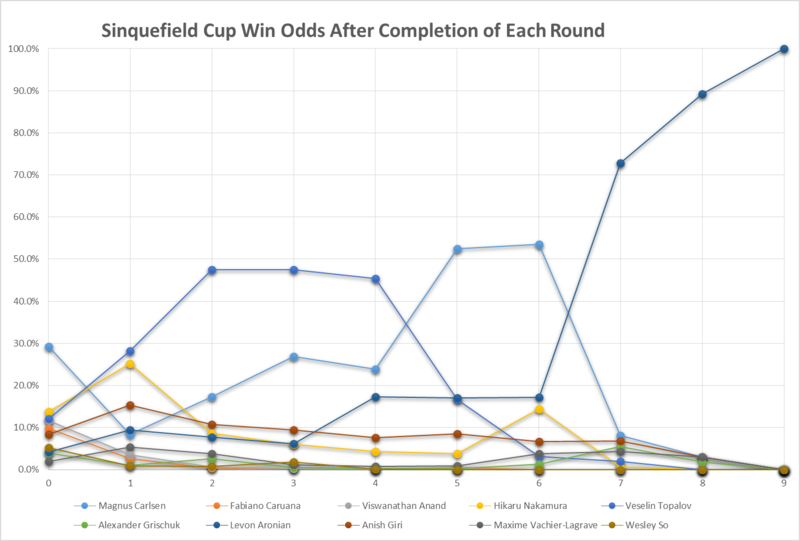 Round 6, while somewhat uneventful for the odds of the Sinquefield Cup, had a huge impact in the GCT odds. Topalov’s loss mattered a lot there, dropping him to just 41% to win the tour, down from 63% before the round. The big gainers were Carlsen (who improved to 27% from 20% by drawing and remaining tied for the lead) and Nakamura (who improved to 19% from under 7% with his win). In our latest Sinquefield Cup predictions, we listed co-leader Levon Aronian as having a 17% chance of winning the event. A fellow poster on a chess forum I frequent remarked that it was “bizarre” that his odds were so low, particularly in light of his “current tactical brilliancies”, and estimated that Aronian’s chances are probably closer to 30%. It’s worth reiterating that our model does very little to attempt to account for a player’s “form”. We do use live ratings updated round by round, so Aronian is getting 11 rating points worth of credit for being in better form than we originally thought based on his pre-tournament rating. However 11 points is not a tremendously large adjustment. We have Aronian at only 17% despite sharing the lead because he shares that lead with Carlsen, who is rated almost 83 points higher than him. Over four rounds, this leads to a significantly increased score expectation, particularly since Carlsen also faces an easier remaining schedule: they both still have to face Nakamura and Anand, but Aronian’s other two games are the two strongest players (Carlsen and Topalov) while Carlsen’s other two games are Aronian and Grischuk. On top of this, we can add in Topalov at just half a point back, also with a relatively easy remaining schedule, and equity for some longshots, and Aronian’s 17% odds make sense – if we stick with the assumption that 2776 is an accurate assessment of his playing strength. We are talking about someone who has been rated as high as 2830 though, and who spent a long time as the #2 player in the world and presumed greatest threat to Magnus’ reign as champion. What if he is “back in form” and we can validly give him a higher estimated playing strength? If we keep everything in the model the same, except that we bump Aronian’s rating up to 2820, his odds increase to about 27%. We can get his odds to 30% if we make his rating 2832. So if you say “I think Aronian’s odds are 30%, not 17%”, you’re not necessarily disagreeing with the structure of the model, you’re just saying that you think Aronian is in good form during this event, and expect him to play at an effective strength of 2832 over the final four rounds. This isn’t particularly absurd, he certainly could do so. Statistically, we are reluctant to give too much credence to the idea of large variations for “form”. Most such phenomena can be explained by random variance alone, and throughout sports a “hot streak” or someone being “clutch” or “in the zone” are generally just false narratives we throw around because they sound more interesting than “he got lucky”. In chess specifically, we apply this idea by assuming that a player’s live rating is the most accurate estimate we have available of his playing strength (it accounts for the most available data, after all). That said, not every player will always be accurately rated at any given time. Since we’ve just established that unexpectedly good or bad results can happen in the course of normal statistical variance, we have to also grant that when those results happen to a player whose rating was previously accurate, that rating will get thrown a kilter. Aronian’s rating plummeted through some very unexpectedly bad recent events. The proper Bayesian response is to factor those results in as additional data, on top of the results that initially got him the high rating in the first place, and re-evaluate him less favorably. This is what we’re doing when we use his current rating in our simulations. It’s also possible, though, that his older results, that brought his rating up over 2800, were accurate reflections of his underlying true long-term playing strength, and then the recent bad results were purely random variance and not reflective of a drop in his abilities. He might still be a 2800, or even 2820, strength player, and the uptick in his rating from good results so far in St. Louis might be regression to the mean, as his currently-too-low rating corrects itself through further random chance. Of course Magnus Carlsen also entered this tournament coming off a bad result, and if Norway Chess was pure variance then perhaps he too is truly underrated. Maybe his real odds of winning are higher! And every other player may or may not be accurately rated as well! We can’t really be sure, so for the model’s sake we will continue to just use the live ratings and let the variance sort itself out over time. He’s back! Magnus Carlsen struggled greatly in his last tournament, Norway Chess, in the first leg of the Grand Chess Tour. This led to two months of speculation regarding what might be “wrong” with the world champion, leading up to the Sinquefield Cup. Then when he lost his first round game in St. Louis, and his live rating dropped below 2850, that speculation began to approach a fevered pitch. Then he recovered. If anything had genuinely been wrong, it certainly hasn’t been in the last four rounds, as he has reeled off three wins in four days, and climbed back into a tie for the lead as we enter the first rest day. Carlsen is now favored over “the field”. Aronian, who is tied with Carlsen for first, now comes in second with about a 1/6 chance of winning the event, just ahead of Topalov who is also around 1/6, but has dropped to third place in the odds (as well as third in the standings) with his round 5 loss. After the rest day, round 6 will pick up with the two leaders facing each other, as Aronian has the white pieces against Carlsen, so we may see some quick resolution of the tie if that game proves decisive. The two other main contenders, Topalov and Giri (tied for third, at half a point behind the leaders) face Vachier-Lagrave and Anand, respectively, and looking ahead will then play each other in round 7. So the next two rounds will offer lots of key matchups with high leverage (meaning they will impact the battle for first place more than the average game). Nevertheless, Topalov remains a strong favorite to win the GCT as long as he can finish near the top in St. Louis. He will only really drop off if he loses another couple games and drops into the bottom half of the standings. Right now we can see that Carlsen is a threat, and that a few others are still alive to contend, but if you had to pick a most likely winner today it would still be the man who won Norway and is currently tied for third at the Sinquefield Cup (and oh yeah, is still the second highest rated player in the world!) It’s also worth noting that Topalov’s odds are much higher now (despite his recent loss) than they were when the Sinquefield Cup began. His odds have risen 21 percentage points, while Carlsen’s odds are up less than 7 percentage points from their pre-event levels. Carlsen was the big winner in round 5 (in terms of odds shifts), but Topalov is still in far better position in the Grand Chess Tour. The huge differential between their finishes in Norway still holds strong. Why is Aronian still in third place, in terms of odds of winning the tournament, when he’s tied for the lead? Part of it is of course the fact that his rating is lower than other players near the top. There’s another component in play too though: schedule. Aronian’s 3/4 start is less impressive than Topalov’s because of who they played when. Topalov played the top three seeds (other than himself) in the first three rounds, while Aronian has not yet played any of them. In fact Levon has to survive a terrifying gauntlet in the final four rounds if he wants to hold onto his lead: Carlsen, Nakamura, Anand, and then Topalov. This remaining schedule, as much as his own rating, contributes to a lower expected score through the remaining rounds, and is a big part of the reason why Carlsen is considered more likely than him to win the event, despite having an extra half point deficit to overcome. Round three of the Sinquefield Cup again saw numerous exciting games, and this time there were two decisive results. Magnus Carlsen took a big swipe at any rumors of his demise by winning his second consecutive game, this time against Vachier-Lagrave. The win brought Carlsen into a tie for second place, just half a point behind the leader Topalov who drew his own contest with Anand. Topalov, with his lead, remains the most likely Sinquefield victor (and a huge favorite in the Grand Chess Tour), but Carlsen has slid his way right back into second place in both hunts.